[William] looked back at the page and tried to make out the details in the three small drawings at the foot of the page. They were enclosed by a border of crows amongst twirling branches and leaves. The first picture showed a hill with trees growing on the top, and in the foreground a white-robed figure with feathered wings. There was what appeared to be the shaft of an arrow sticking out of its chest. A chill went through William as it dawned on him what he was looking at. [Me again.] The passage goes on to describe the second and third pictures as well. Try as I might I couldn't find a medieval image of a "white-robed figure with feathered wings" (angels were much more colorful back then). 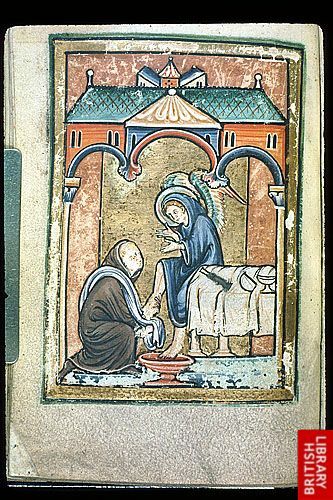 William's angel probably would have looked more like this one, from Bede's Life of Cuthbert (England, N., last quarter of the 12th century), blue-robed and rainbow-winged. I think this manuscript is a good fit in terms of period and setting for the book in question, a lovely new middle grade novel set in a mythical, medieval world.